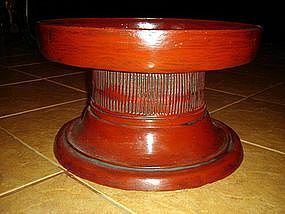 A genuine antique wooden flower offering tray with cinnabar red lacquer, 19th Century, Northern Thailand. Small size: H. 5.5" x 7" diameter (14 cm. x 18 cm.). Condition fair, used. Very difficult to find! 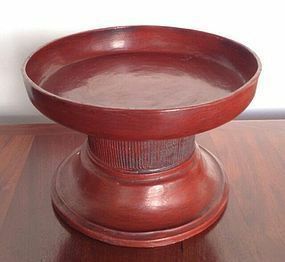 An antique 19th Century solid wooden offering tray from Northern Thailand with cinnabar lacquer finish. 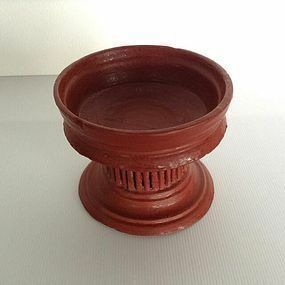 Medium Size: H. 4.75" x 10" diameter (12 cm. x 27 cm.). Good overall condition, no restorations. Difficult to come by! A very rare THAI 18/19th Century Black & Gold Lacquered Bamboo container with scrolling and flowers. Top rim partially restored as can be seen in photos due to considerable age and climatic conditions. Gilding shows some wear. Overall in fair condition. Size: H. 12" x 13.5" diameter. Impossible to find in this era! 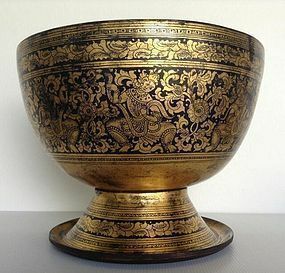 An exquisite and very rare 18/19th Century THAI OFFERING BOWL, hand made, lacquered bamboo with fine gilding on a black background depicting detailed scrolling, flowers and several dancing Apsara divinities. 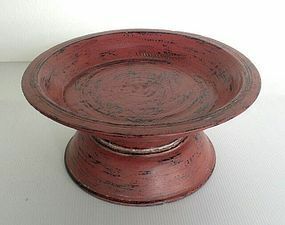 In contrast, the interior of the bowl is cinnabar red color. Good condition overall, size: Height 9" x 12" diameter ( H. 23 cm. x 30.5 cm diameter). This is truly a collector's piece and impossible to find in our era! 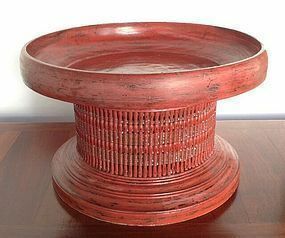 A very large and rare Cinnabar Red Wood and Lacquer Offering Tray, 19th Century, Northern Thailand. Good overall condition, some wear due to considerable age. Size: H. 31 cm. x 51 cm. top diameter. Very difficult to find now. 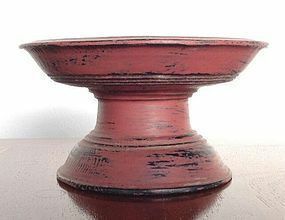 A rare and small antique Cinnabar Red Wood and Lacquer Offering Tray, 19th Century, Northern Thailand. Overall condition good. Size: 10 cm. height x 18 cm. top diameter. 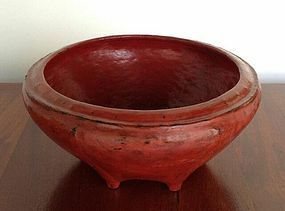 A rare antique Cinnabar Red Lacquer Basket from Northern Thailand. 19th Century. 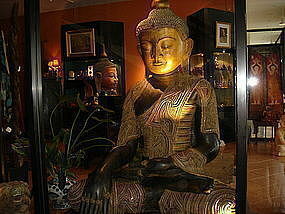 A very labour intensive handmade procedure where woven and coiled bamboo and clay formed the base of this container. Furthermore, 6 ribs were bent and curved to form feet at the base. The top was curved and rolled inwards and many coats of lacquer were applied over and over after drying each one. Overall condition good, some wear, size: 17.5 cm. height x 38 cm. top diameter, 24 cm. bottom diameter. 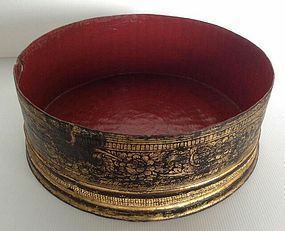 An original antique Cinnabar red Lacquer Offering Tray from Northern Thailand, 19th Century. Overall good condition. Size: height 39 cm. x 26.5 cm top diameter. Very hard to find now.